« Just Another Correction Or A Trend Shift? Why wait till it is over like the National Bureau of Economic Research does? I’m officially announcing it: we are in a recession. The first spike up was after the February 28th 2007 market meltdown (which was blamed on the Chinese market’s gyration). 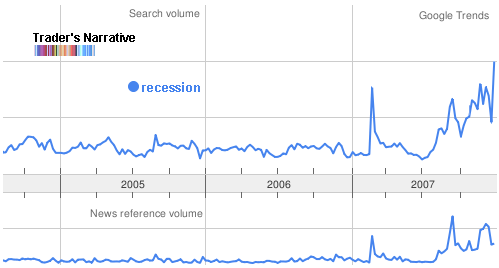 But now we’re setting new highs in the number of people searching for the word recession. Which means that the Fed is continuing to play catchup as they have been since their founding. They should be much more aggressive in cutting rates. I really like your posts, specially the ones about market sentiment, and also I liked the google trends analysis. I tried some research in google trends to see if there is any correlation with the Brazilian market (I live in Brazil)and I have found some ex-post evidence for some market turns, but still nothing that I could use myself in day to day trading. Also I have a Blog in which I have posted the results, unfortunately it is writen in portuguese, but if you want to check it out the charts might speak for themselves. Are you still expecting a market rally like in your second to last post? yes, nothing material has changed so my expectations haven’t either. obrigado, I know a bit of Spanish so I could follow along. - but where’s the link love? Sandor, lol, I meant a link to my post you mentioned. We are not in a recession, and I wish people would quit parroting that tripe. The GDP experienced a 0.9% growth last quarter; which was better than the same time last year. Nobody was crying “recession” last year. The only real reason the word recession is even coming into play is that its an election year, and its a sure way to get people scared. 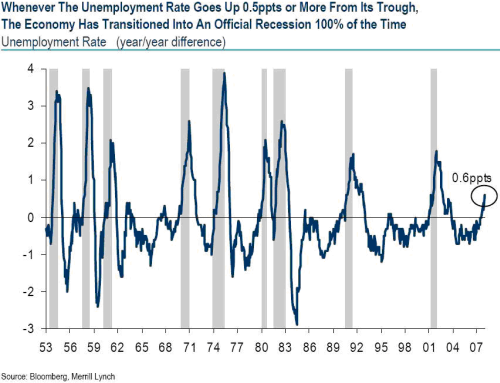 Truth is, we’re not in a recession, nor are we likely to hit one this year. Nice call - spot on!